Namrata Biji Ahuja of 'The Week Magazine' has been awarded the IPI (International Press Institute) India Award for excellence in journalism 2018. 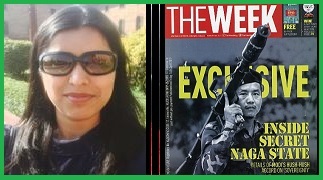 Namrata Biji Ahuja is a senior special correspondent with The Week magazine. She has received this award for her exclusive story on Nagaland underground camps. IPI India Award for excellence in journalism award consisted of a cash prize of Rs 2 lakh, a trophy, and a citation. The jury was headed by former Attorney-General of India Soli Sorabjee. IPI India had instituted the award in 2003. It is awarded annually to honor the best work done by an Indian media organisation or journalist working in print, radio, television and internet mediums. IPI India Award for excellence in journalism recognises work done in public interest, safeguarding of freedom of the press and other freedoms like human rights. The first Award for Excellence in Journalism, 2003 was given to The Indian Express for its reporting of the Gujarat riots and its aftermath.